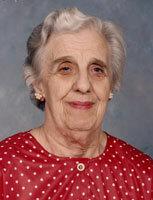 Ella Frasch Stadel, 89, a resident of Brethren Village, died Sunday, May 13, 2012 at the home. Born in Constantinople, Turkey she was the daughter of the late Alexander and Alvina Frasch Stadel. Ella was a housekeeper for many years at J.C. Snavely & Sons, Inc. in Landisville. She was a member of Zion Evangelical Lutheran Church in East Petersburg. Surviving is a sister-in-law, Ann Johnson of East Petersburg, and ten nieces and nephews. A Funeral Service will be held on Thursday, May 17, 2012 at 2:00 P.M. at Zion Evangelical Lutheran Church, 1905 Broad Street, East Petersburg, PA. Friends may call at the church on Thursday from 1:30 P.M. until the time of the service. Interment in the adjoining church cemetery. In lieu of flowers, contributions in her memory may be made to the Brethren Village Benevolent Fund, 3001 Lititz Pike, Lancaster, PA 17606.